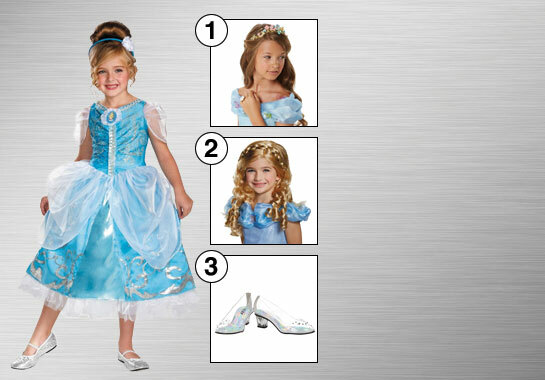 She'll go from dirty and ragged to beautiful and perfect this Halloween when she wears something from this collection of Cinderella Costumes! The classic blue dress, provided by the fairy godmother, is sure to turn heads at a costume party, or make trick-or-treating even more fun than before! There are also great accessories like tiaras and wands! A dream is a wish your heart makes when you step into the magical world of Cinderella. Make a lifetime of wishes come true for any fairy tale lover with an extensive collection of dreamy blue gowns, glass slippers and sparkles. Get your family and friends involved as there’s a character for everyone in this delightful tale, from Prince Charming to the devious Lady Tremaine. With the flick of a wand, anyone can transform into her favorite character and be on her way to the royal ball at last. Have you ever wanted to be a Fairy Godmother? Have fun as a foolish step sister? Don’t wait to get ready for the ball—your carriage awaits! Just be careful to keep track of your glass slippers. Who Will You Go to the Ball As? The lovely Cinderella knows the importance of having courage and being kind. She overcomes hardships simply by being gracious and benevolent. Miracles take time, and all of Cinderella’s dreams finally come true with the help of her Fairy Godmother. As the heir to the royal throne, Prince Charming’s father orders him to find a bride at the ball. But the prince isn’t interested in just finding a wife; he’s searching for true love. His life changes forever when he meets Cinderella, and with a touch of a miracle, the two live happily ever after. Jealous of her beauty, Drisella does everything she can to ruin Cinderella’s chance at a happy ending. 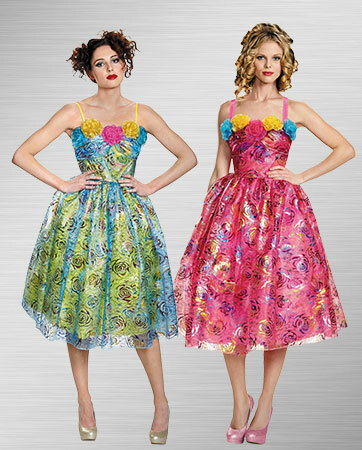 The older stepsister, Drisella is known for her eccentric fashion choices with bright fabrics and colors. Motivated by jealousy, Lady Tremaine is a figure of grace and self-control. She’s constantly reminding her daughters to work on their posture and poise. She wants them to marry rich so their family can climb the social ladder. Anastasia is the clumsy stepsister of Cinderella who hopes to marry into the royal family. She doesn’t always get along with her sister, Drisella, but the two do their best to sabotage Cinderella’s chances of going to the ball. The Fairy Godmother makes the magic happen. She lights up Cinderella’s world as she generously uses her magic to make dreams come true. She uses her kind, motherly spirit to guide and keep Cinderella’s hope alive. 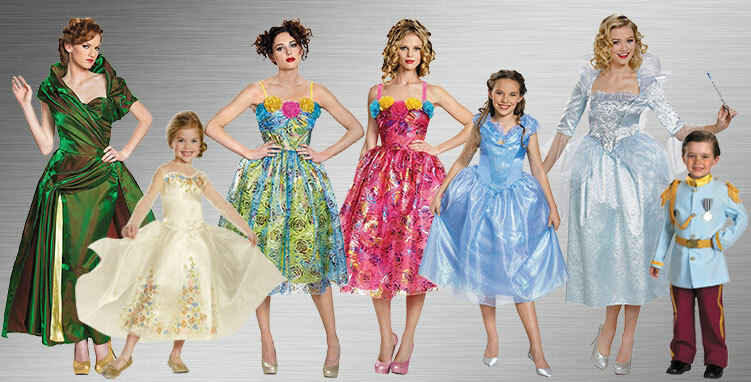 Everyone will recognize your little ones when they dress up as these iconic fairy tale characters. 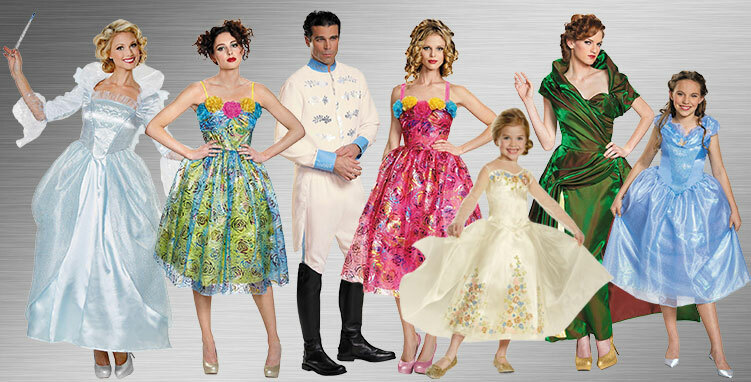 They’ll feel like royalty in the fabulous gown and dignified, magnificent jacket and pants set. Both of these kids will charm the socks off trick-or-treaters and partygoers alike. Looking for a classic couple’s costume? You can’t go wrong with one of the most popular Disney fairy tale couples. 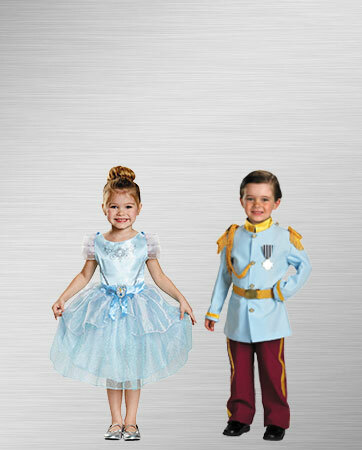 Cinderella and Prince Charming will steal the show with their regal outfits and attitudes. Find a friend or sister and have a ball when you dress up as Anastasia and Drisella, Cinderella’s funny stepsisters. You two will keep the party interesting with your humor and clumsiness as you light up the room with shiny fabrics and bright colors. 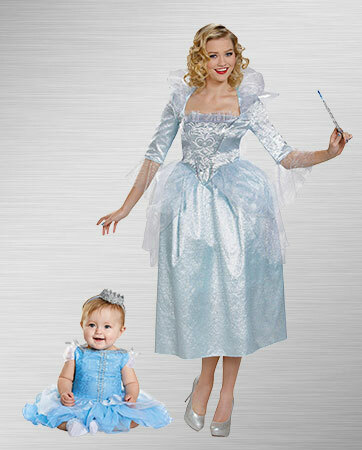 Be a true Fairy Godmother and guide your little princess to the next big costume event. She’ll love knowing she has your support, even if your wand isn’t really magic! Show her the meaning of courage and kindness. 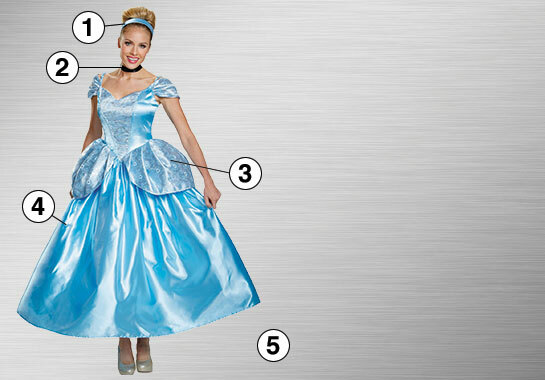 Where there is kindness, there is goodness, and you’ll sure be looking the part when you twirl your skirt in this beautiful Cinderella costume. Feel like you’ve stepped right off the movie screen and onto the party scene. In your blue peplum dress, you’ll turn heads as everyone eyes the elegant swirl pattern on the bodice and shoulder straps. Your look isn’t complete without the matching blue headband to keep your smooth bun in place and Cinderella’s signature black choker. 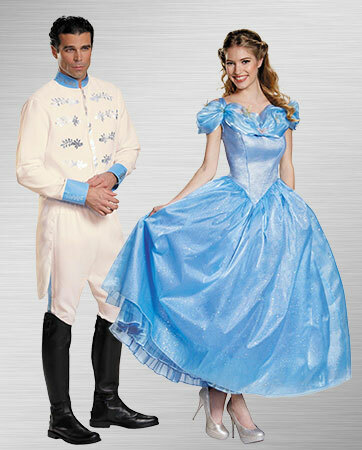 As an officially licensed Cinderella product, this is the ultimate costume for any fairy tale lover. Any little girl would love to feel like a princess for a day, especially one as gentle and kind as the lovely Cinderella. Thanks to her Fairy Godmother, she’s ready to be whisked away to the ball in a golden pumpkin carriage. Her gown is just like a real ball gown, complete with a petticoat underneath. With sparkly silver details, cap sleeves and ruffles, she’ll become the belle of the ball right before your eyes! Showcase Cinderella’s happily ever after with an enchanting wedding ring and tiara She already has Cinderella’s shining personality and now she can have her shimmering blonde hair, too! Add a blonde wig to the costume for an extra touch of elegance. And it wouldn’t be a Cinderella story without the rhinestone glass slippers. Make sure to get everything she needs to look her best, and make sure she’s home by midnight!